Chardon, OH is the center of the "snow belt" in Northeast Ohio. It is also the county seat for Geauga County. 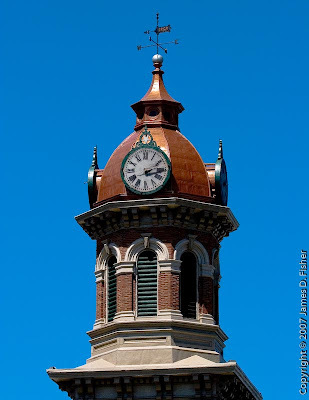 The town has a traditional town center square and at the north end of the square is this beautiful county building. I thought it would be a good opportunity to try out the Canon 100-400mm L zoom lens. 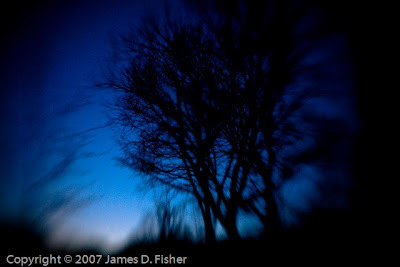 All of these images were taken on the Canon 20D which has 8.2 mega-pixels. You'll see by examining these images that good glass (lenses) is more important than lots of mega-pixels. Let's start out at 100mm. Lots of detail and good saturation. Let's move up to 200mm. Again, plenty of detail and saturation as we get closer to the clock. 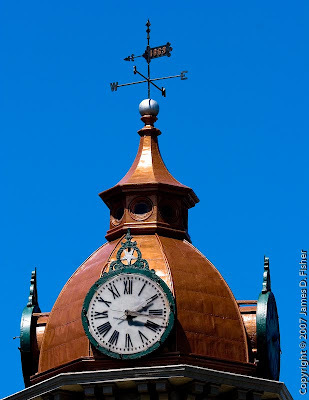 The weather vane was cropped from the second picture. It still has plenty of detail. 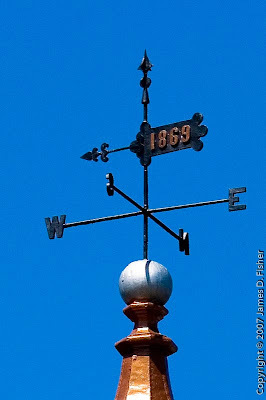 You can easily read the 1869 sign. No signs of chromatic aberration (red/blue fringing) either. 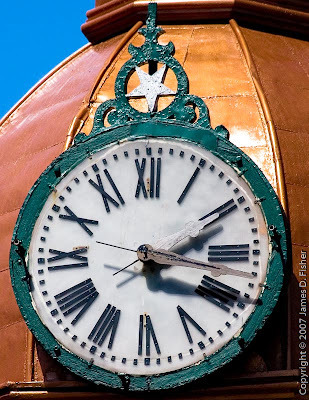 And finally, a close-up of this beautiful clock. The sun is spanking the dial and the colors are glistening. I admit that this was probably an easy test for the lens. The sun was bright so getting a good exposure was easy. The lens performed as it should for an 'L' series. 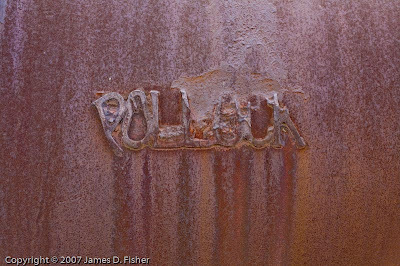 What I liked was the ability to crop into the images and extract the most interesting objects. The simple rule here is get good glass if you can afford it. It's more important than the camera body and is the best investment in the long run. Camera bodies wear out or become obsolete, but lenses generally last forever. I'm starting to feel good about Cleveland sports these days. The Indians are in first place. The Yankees are in last place. Our starting pitching is excellent. Our closer has 9 saves, tops in the AL. And one of our starters nearly pitched a shutout Sunday and now has to return to the minors. Too bad for Fausto but it shows the depth of the pitching staff. The Cavaliers are about to sweep the Wizards. They don't have to face the Pistons in Round 2. That's great (but I think New Jersey will be tough). And who's complaining now about Z and that fat contract he signed? He's having a great playoff with double-doubles every game. Best of all, the Browns pulled off a terrific draft on Saturday. The game of football is all about blocking and tackling and if you do that better than the other team you usually win. That's why Joe Thomas, OT Wisconsin, was a great choice at #3. Picking up Brady Quinn at #22 was a stunner. Not only do we get a top-rated pick but we get him at value price. Brady gets no huge contract until he proves himself. Giving up our 2008 #1 pick is not a big deal. If it's in the top 5, you always over-pay and the risk is greater. We got our next year's #1 this year and at the price of a #22 pick. Not bad. Do you really think Charlie Frye is the QB we need? Maybe it's time for us tortured Cleveland sports fans to forget about the past and hope more for a great future. It may come sooner than we think. It's just a snapshot of a window washer. But I hope this is leading me to the one great picture which I'll take because I'll have my camera with me. It could be, dare I say, a Pulitzer Prize winner! But that would probably mean it is a picture of death, destruction, or some other malaise. If you review the winners of the Pulitzer Prize for photography from 1968 to 1999 you'll see most, if not all, fall into those ghastly topics. Most of the photographers were either students, staff photographers, or amateurs in the right place at the right time. Hmmm, if I cut the rope maybe I'd get my Pulitzer Prize? O.K., here's the plan. 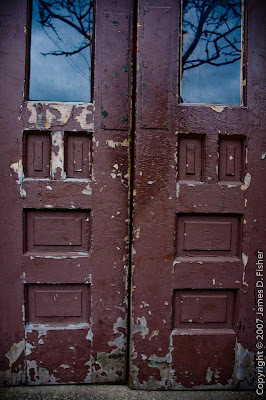 Take picture of two worn doors in Cleveland's Little Italy with reflections in the glass of the sky and craggy trees without getting yourself in the reflection! If you haven't made it over to the Cleveland Museum of Art for the Monet in Normandy exhibit you only have a few weeks left. It is fantastic! My wife, Mary, and I finally made it there tonight and walked through the exhibit several times. For photographers, studying painting is useful because of what you can learn about composition. 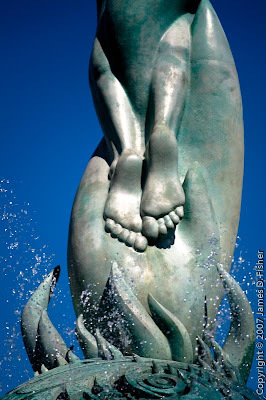 The great painters did wonderful things with structure, depth-of-field, and lighting that will help any photographer. Take for example Monet's Garden at Sainte-Adresse. Note the high horizon line and depth-of-field. A photographer would take this image using a wide angle lens, perhaps a 24mm, in order to capture the subjects in foreground, but with a smaller aperture, to make sure the ships in the background are in focus. The high horizon line helps lead the viewer from the people in the foreground to the ships in the background. Another example is La Chapelle de Notre-Dame de Grâce, Honfleur. Instead of plunking the chapel in the middle of the image, Monet leads the viewer to and from the chapel with the road which protrudes diagonally from the corner and from the gentle slope of the tree line. Not all skies need to be blue with white, fluffy clouds as Monet shows with The Pointe de la Hève at Low Tide. Here the sky forms the mood for the image. Monet does this in many of his works, using the sky solely as an instrument to set the mood, whether it be grey for drab moods, turbulent for storminess, or bright for joyous moments. The images I linked from the Museum of Art Web site are not anywhere near the quality of what's at the exhibit. I urge you to see the exhibit in person before it's too late. 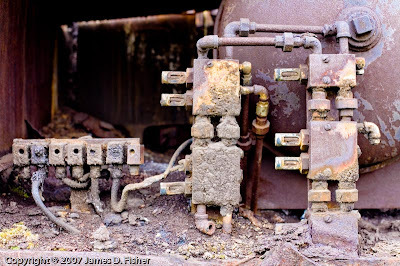 This series is for all of you who like to look at old, rusted-out, industrial stuff. 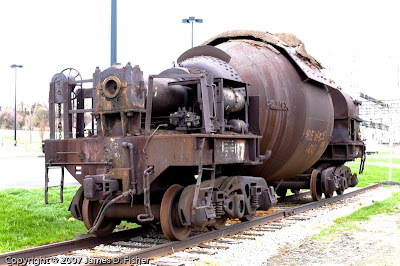 I spotted this steel mill hot metal bottle car in the back of the new Steelyard Commons shopping center. Apparently the bottle car is part of a steel mill exhibit at the commons. There weren't any signs or labels that mention what it is and what it is doing here. The bottle car sits on track with the steel mill in the background. 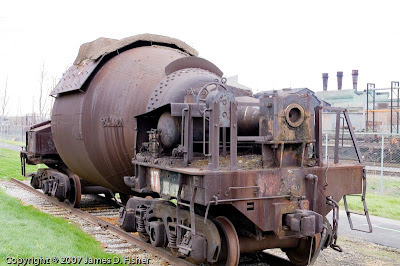 It's a big, hulking mass of steel and was used to move molten iron through the plant. This is what's left of the manufacturer's logo on the side of the ladle. 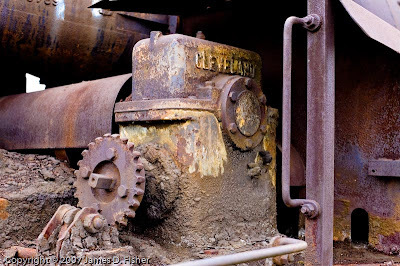 It shows plenty of wear and tear from years of labor in the mill. 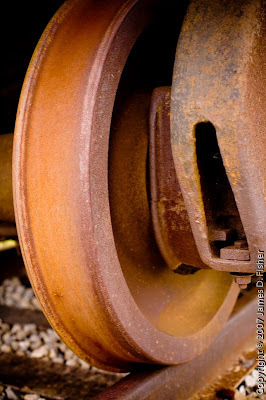 A nice rusty image of a steel train wheel. Not sure what this is but it's full of gunk. Don't you just want to take a putty knife to this? 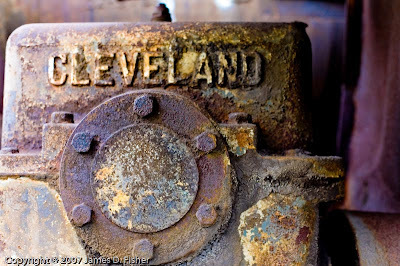 A gunky device with the "Cleveland" name protruding. Doesn't this say it all about our past? 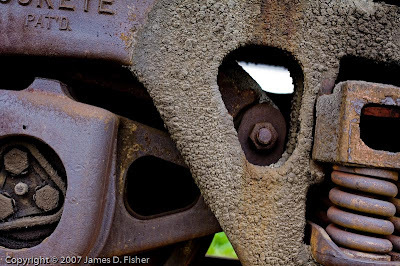 Industrial, tough, hard-working but aging. A closeup of the brakes. 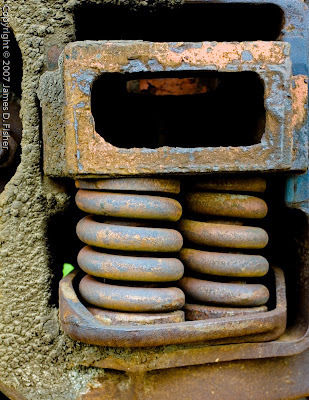 Another closeup of the springs. Fluid components looking like they've seen better, and cleaner, days. Check it out at Steelyard Commons but leave your scrapper or putty knife at home. 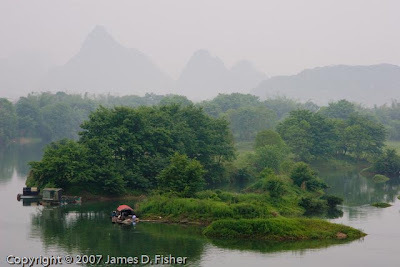 The Li River or Li Jiang in Guilin is one of the most beautiful river courses in the world. It is known for two distinct features, one is physical and the other is economic. The first is the craggy but beautiful "karst"-limestone hills that jut out all over the province. It looks like a mystical dreamland. The other is the fisherman and their "cormorant" or diving birds. The region had been immortalized for centuries by Chinese poets. 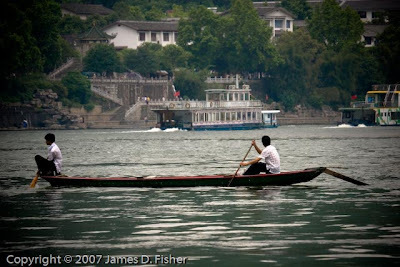 One of their praises read, "He who sails along the Li River finds himself floating in a sweet dream." Beyond the hills and the birds there is plenty of activity along the river and many beautiful things to see. Enjoy the ride! 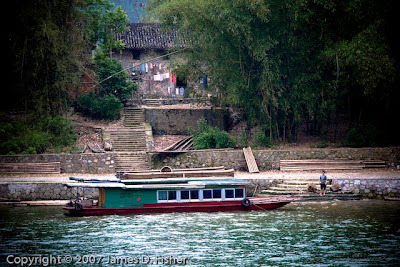 Small fishing villages are scattered throughout the Li River. 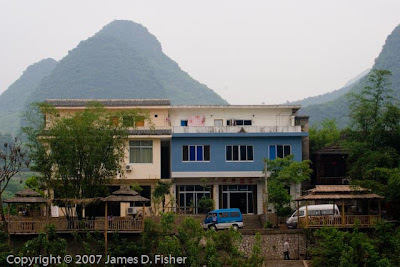 Out in the rural areas Chinese instituted "communes" still exist. Many of the parents and grandparents who live in these villages were forced here in the 1950's and 60's by Mao. Most people are trapped here without enough capital to grow, diversify or just leave. They are left with only farming and fishing in order to live out their days. Cruise boats lumber in caravans down the river. 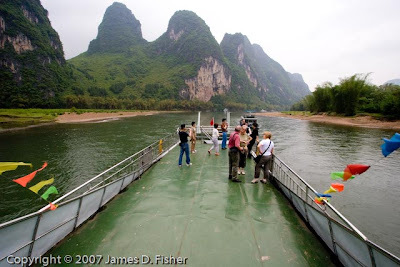 Last year an attendance record for set for Li River tourists averaging over 200,000 per month in the summer. My trip was in April 2005. Our boat was not crowded. Most of the passengers were down below because of the drizzle. In the background you can see the huge "karst" hills. It's beautiful and scenic but it is only a backdrop to a very sad reality of the rural Chinese people. Unlike the dwellers in the large cities they have very limited economic opportunity and political freedom. 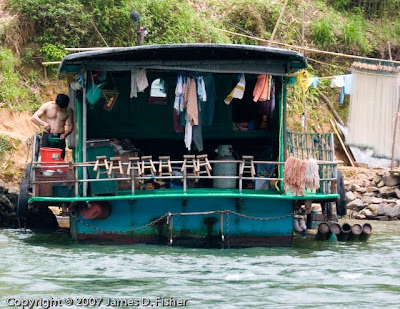 On the back of the cruise boats is the kitchen and dish washing facility. 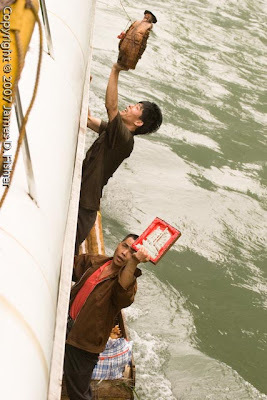 A young boy has the duty of flagman for this cruise boat. 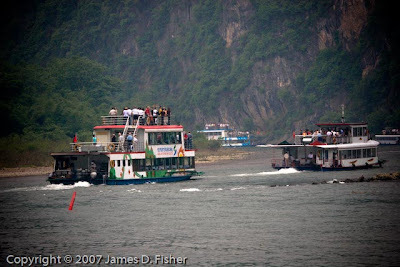 Two peddlers eye a pair of cruise boats churning down the Li River. About every half mile the cruise boats are targeted by peddlers who row right next to the cruise boats and plead with tourists to buy their goods. 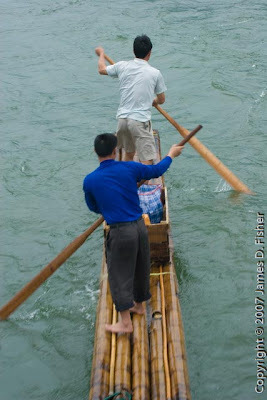 The boats are made of bamboo and can move fairly fast in the water. Once alongside a cruise boat, the peddlers will plead with passengers to purchase goods. Usually it's a carved object like an elephant or monkey. Most tourist buy their goods out of sympathy for their plight. Some villages have their own pier to support the activities of many fisherman. 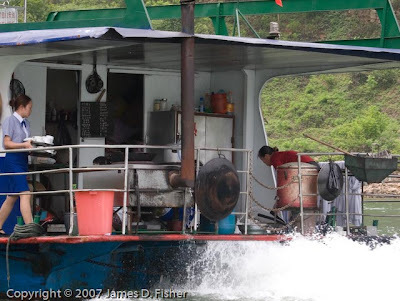 This is a typical fishing vessel. It is large enough to be used as a home for a Chinese family. Don't be surprised if five or more people live aboard. Some villages are large enough to have roads, vehicles and shops. The little blue van is a common vehicle in China. They are used for everything including taxi rides. 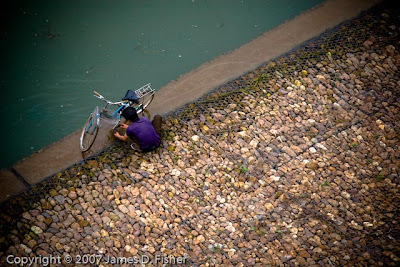 A young boy fixes a bicycle along the Li River. The stone pier is covered with a type of "chicken wire" to hold the rocks in place. A boat launches out for a day of dragnet-fishing. The most delicious fish from the Li River is the steamed Mandarin fish which is so tender it will literally melt in your mouth. Two girls think about taking a dip in the water. It looks a bit polluted to me but China is all about water. Several major rivers and thousands of tributaries flow Northwest to Southeast and on to the ocean. Sanitary conditions are not up to any Western standards. Bottled water is a must for all foreign travelers. Help! I have these two stupid birds stuck to my pole! 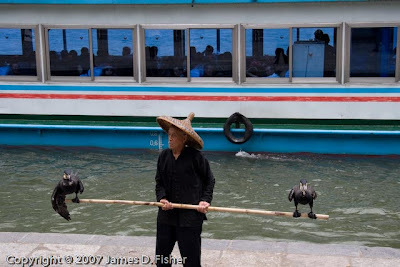 These birds are actually the cormorants, or fishing birds. At night the fisherman takes them out in his boat and they dive for fish. During the day the fisherman hangs out on the pier and charges 5-10 yuan for anyone who wants to take a picture with him. Not a bad way to pick up some pocket money. Here's a pretty well-worn vessel, longer than most, at its dock. 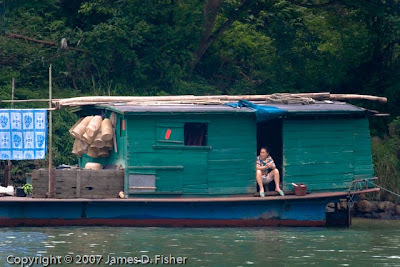 A woman relaxes in her fishing boat/"home" which is also her source of income. You find entire families living on some of these boats. 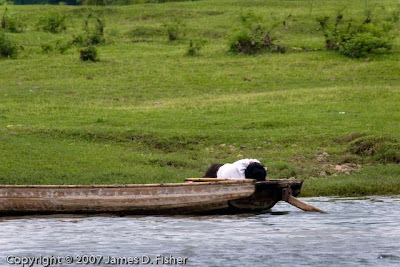 In the West you would chuckle if you saw someone napping like this but in China many people work multiple jobs and sleep is taken whenever the opportunity arises. 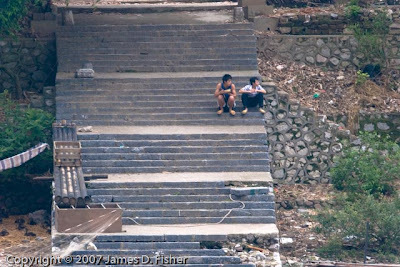 You'll actually see scenes like this all over China. The average monthly income is $25 to $300 per year so any additional job helps. Unlike India and other third-world countries, the Chinese always have enough to eat. Starvation is unheard of in a country of well over a billion people. 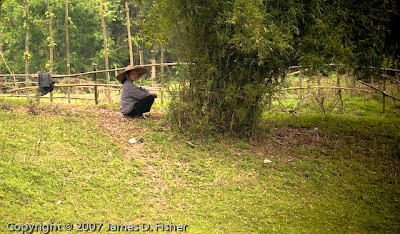 A woman relaxes in the shade along a riverside farm. 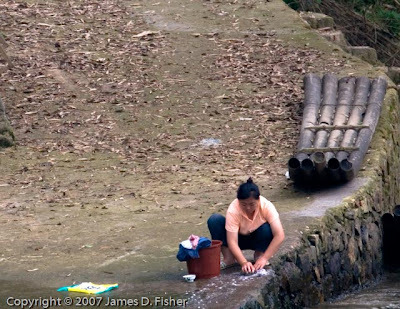 Another woman heads down to the river to wash clothes. Life is simple here. A fisherman prepares his nets for a day of work. Because of pollution and overfishing it is more difficult to get a good haul of fish. 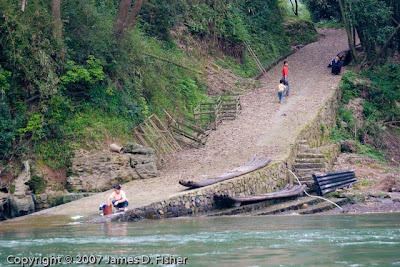 While hardly anyone in America is solely dependent on a river for their livelihood, the opposite is true for much of China. 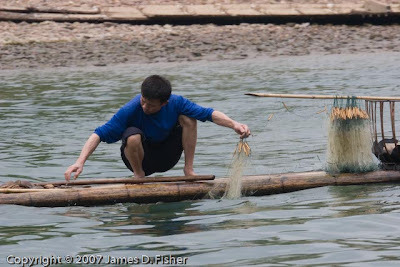 The river is a major source of food, water, cleaning and employment. 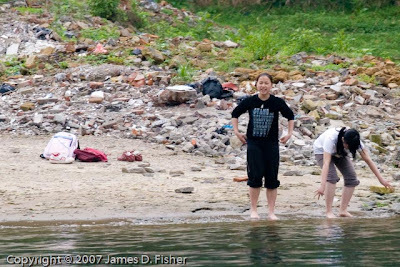 Here a young woman washes clothes by scrubbing them across rocks along the shore. A pathway leads to a village where a group lives in a communal farm. 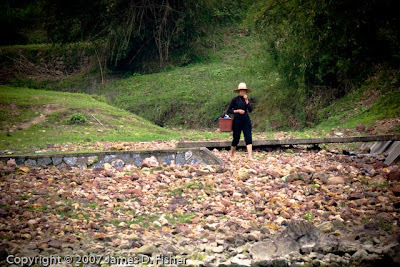 They grow rice, peppers and catch fish in the river. Some members work on the larger cruise and fishing boats. Again, for all you hear about China's new prosperity, the average person is very poor and lives a meager life. A man prepares to paint his vessel. 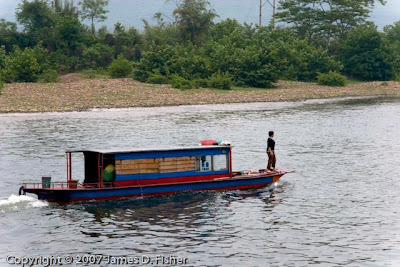 The green and blue vessels are a common color combination along the river as you can see from the image below. No, they are not the same vessel! 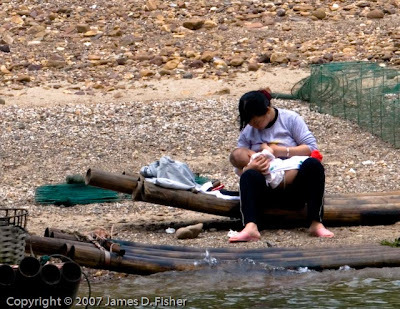 A family takes a break onshore to do some washing and purchase supplies. There are ten people here. The boat is big enough to hold all of them. 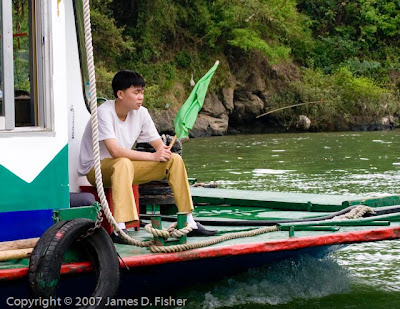 Two boys watch the river traffic. Unless they get an educational opportunity they will probably live their entire lives along the river. Some Chinese are migrating to Shanghai and other large metropolitan areas to find work. 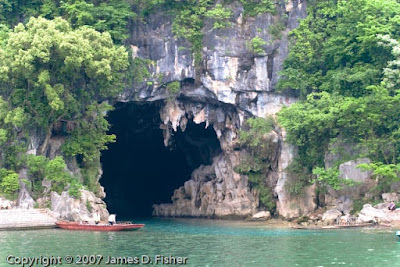 A beautiful cave entrance along the Li River. The enterprising villagers offer boat rides into the caves. If you enlarge the image you can see laundry hanging out to dry on the trees above the boaters. 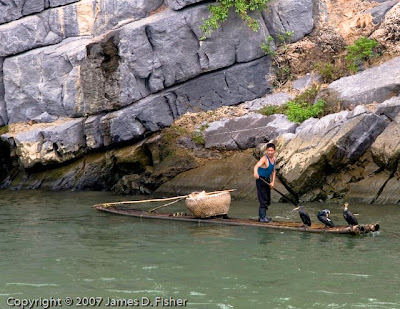 A fisherman rows out to the river with three cormorants or "fishing birds." The fish will dive out into the water and catch fish in their mouths. Around their necks is a "choke" rope which prevents them from swallowing the fish. The fisherman retrieves the catch from the bird's mouth and then rewards the bird with a smaller piece of food they can swallow. There are many wonderful pictures of these boats and cormorants working the river at night. The boats have mystical-looking red lamps that glow like fire at night. Unfortunately, I did not have opportunity to get that image. But I'll be back. 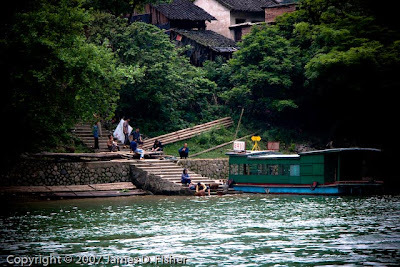 There is much more to show and tell about the people of the Li River but I hope this gives you a small picture of how these people live. They smile and laugh and are happy to do business with you. But you wonder what they are wondering, how high their dreams are, and how good we have it just to be born in America. It's nothing to be ashamed of. It just shows how important it is for all mankind to see the global and spiritual links that are already in place. Think about that! I know I do. 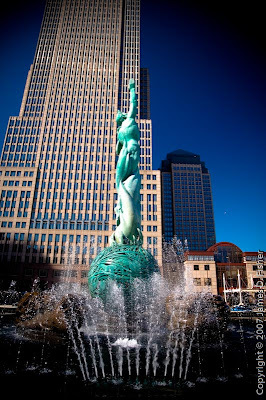 These images were taken on a very bright, beautiful Sunday morning in Cleveland before the Cavaliers game. The sun was at an 11am position which is not the best for photography. Every object becomes harsh looking because of the sunlight. 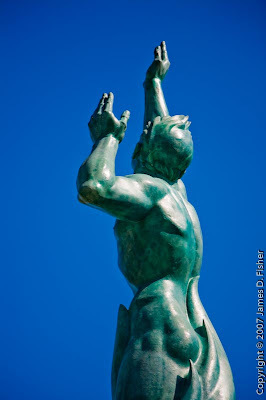 Also, the sun was positioned directly behind the sculpture such that I could not shoot it from the front. 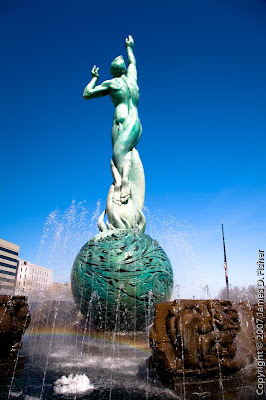 All in all, the lovely blue sky and the colors of the sculpture and the surrounding buildings help make these pictures work. 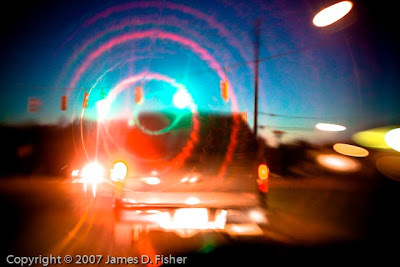 I had some fun with the LensBaby tonight. It was late and I wasn't finding anything interesting to shoot at the family farm. So let's take a whack with the old LensBaby. 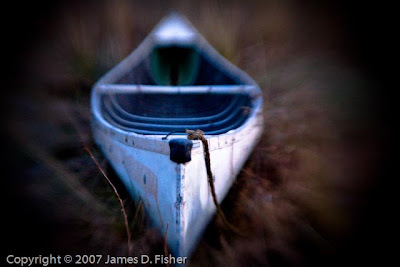 How about an old canoe in the twilight? Wow! Front-focus. Plenty of bokeh. Just leaps out of the picture. Tree silhouettes in the twilight. Take the grey sky and push it to frigid blue. Nice. Hate waiting at traffic lights? Me, too. 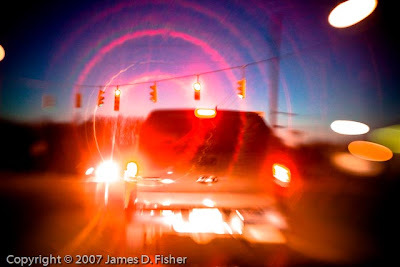 Just pop up the camera and LensBaby the night lights. Here's another one with green swirls too.